All Star CM1100PRO 31.5 inch Catchers Mitt Pro Grade (Right Hand Throw) : The CM1100PRO is a professional grade mitt designed for smaller hands. 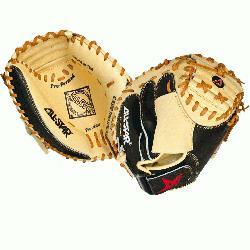 It features soft leather for faster break-in and a wide heel channel to make it super easy for youth catchers to close. 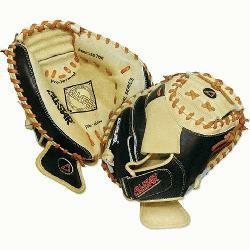 Black and tan leather mimics the adult pro level mitt and uses similar cutting patterns. Deep pockets, Flex Action crease, velcro closure, and wrist protector included.